It was my Embroiderers Guild meeting on Monday and we were due to swap our Travelling Sketchbooks for the next round, so at the weekend I thought I’d better stitch something to go in the book. It was my turn to create something for a sketchbook on the theme of maps. As soon as I saw the theme I knew roughly what I wanted to do. Whilst we were clearing out our ‘under the eaves’ space last month I came across some old maps of my Dad’s, I love looking at maps, both old and new, I can spend hours poring over them. These maps are from the 1950’s, mainly England and Scotland and what particularly appealed was that they are linen backed. I’ve seen a few embroideries on Pinterest that used maps as a base and it crossed my mind that being linen backed they would be a lot more robust for embroidering. 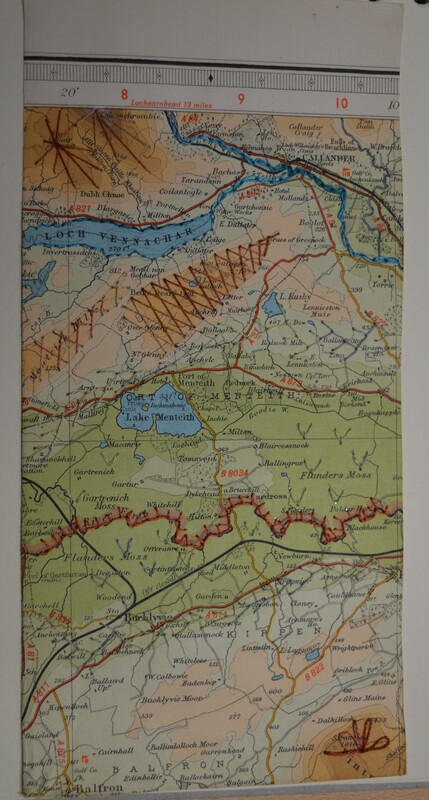 I chose a rectangle from one of the Scottish maps, choosing it mainly for it’s variety of topography, it had a loch, some mountains, wide valleys, a few features to work with. I realised as soon as I started sewing that one issue was that when coming back up with the needle it was difficult to hit the right spot and I didn’t want lots of holes, I quickly hit on the idea of making a hole from the top (sometimes several at a time) which I could then pass the needle through from underneath, it worked! The only other issue I had with sewing the maps was trying to secure threads at the back, I passed threads under some stitches, but at the end I also stuck a few short lengths of sellotape. It was only when I was finishing off the embroidery on Sunday and sticking it in the sketchbook that I noticed a hand-written name and date on the margin of the map. I’ve no idea who the name was, but the date was 17th March 1953, 66 years earlier to the day! It’s been an interesting project to stitch this time as it’s something I’ve fancied trying for a while, it hasn’t come out quite as well as I hoped but I will try again, maybe with some machine embroidery, or a little chiffon over areas, I think the idea needs developing a bit! This entry was posted in embroidery, The Travelling Sketchbook and tagged embroidered maps, embroidery, Scotland, Travelling Sketchbook. Bookmark the permalink. Margaret, I really look forward to travelling sketchbook blogs from you as I think its such a creative thing to do. So clever. As an aside, one of the digital copying firms can print the map onto fabric as well, but you probably know this. You then have another way of stitching maps and really working into them to tell a story without creating damaging holes. It also gives you the facility to stitch provenance if you want. When I was doing my artist’s book diploma at university, I wanted to hand-stitch paper creatively and learned very quickly how difficult it can be. Thanks Prue, I’ve often thought about getting a map printed on to fabric. It will be interesting to try machine stitching on them as the linen does make it a lot stronger. What a treasure – both to begin with and what you ended up creating! That is a beautiful map – I enjoy poring over them, too. Love the idea of stitching on one! Aren’t coincidences such as the date intriguing? I love maps too, they are just fascinating to me. Your idea was perfect for this sketchbook, and you got a good variety of stitches too! Interesting idea, and I look forward to seeing what you do next. What a brilliant idea! This is wonderful – a great addition to the book and a great way to use the map. How interesting that you embroidered this on the right day. That is a very intriguing idea! I love this new direction you’re taking! That is really neat! So glad you shared. Such a creative idea and a wonderful historical treasure!